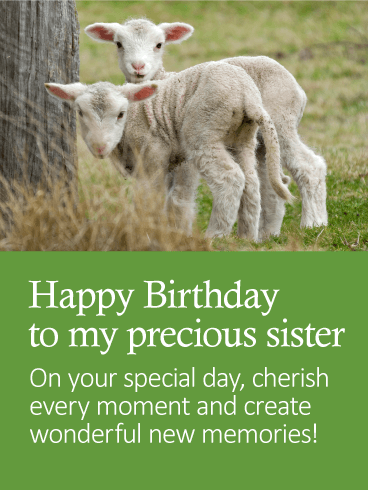 These sweet little sheep help you share a special message with your precious sister on her birthday: "Cherish every moment and create wonderful new memories!" 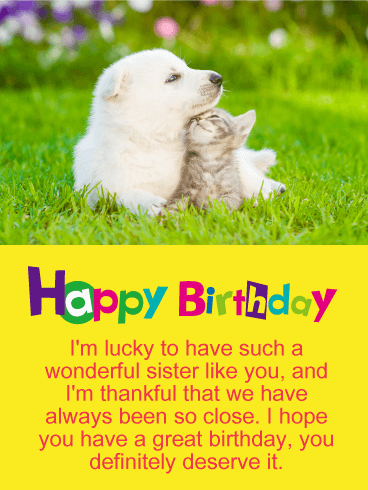 Both charming and heartwarming, this birthday card is one she's sure to love as she turns another year older surrounded by the people that make life worth celebrating. Most people have a busy schedule and don't take the time to relax. 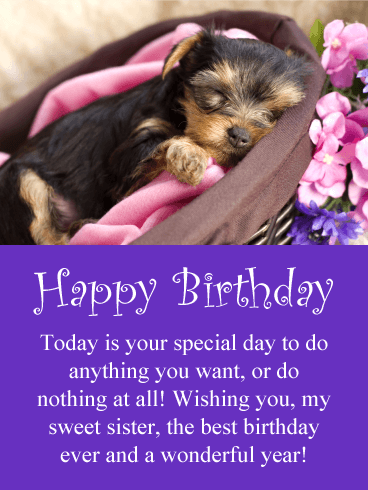 If this sounds like your sister, then she could use a great birthday card like this to let her know it's ok to do whatever she wants on her birthday, even if that means taking a nap! After she sees how peaceful this birthday puppy looks, she might take your advice. Send this sleepy puppy over to your sister soon before the birthday festivities get started. 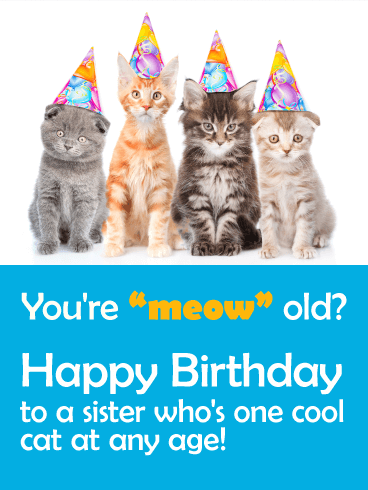 Get out the party hats...it's time to celebrate a special sister on her birthday with this "purr-fectly" funny birthday card she'll love! These kitties can't believe how old she's turning because she's "one cool cat at any age!" 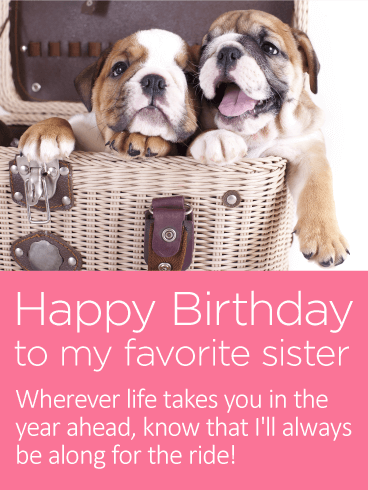 Whether it's coming from one sibling or a bunch, you can bet this hysterical birthday greeting will have her laughing! He's running! He's jumping! He's here to wish your sister a happy birthday! 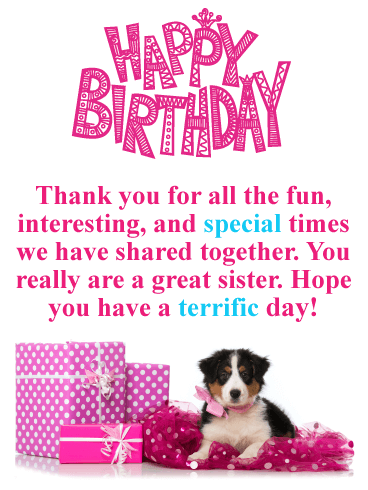 No one can resist an adorable dog, and this one really helps convey the birthday cheer. 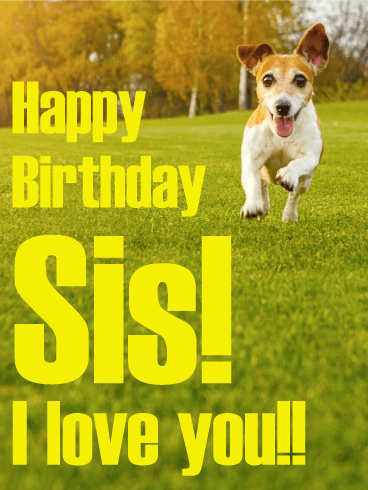 For your sister celebrating a birthday, this birthday card is a must-have. It's fun, it's sweet, and still has a kind and loving sentiment behind it. 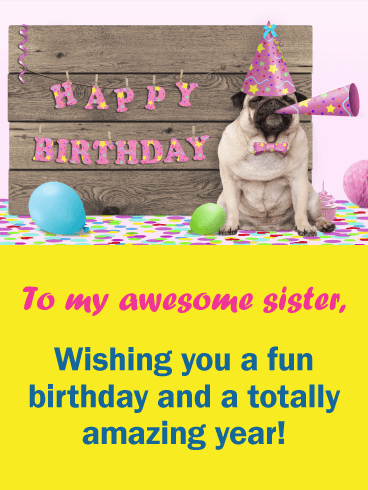 Need some help wishing an awesome sister like yours a very happy birthday? 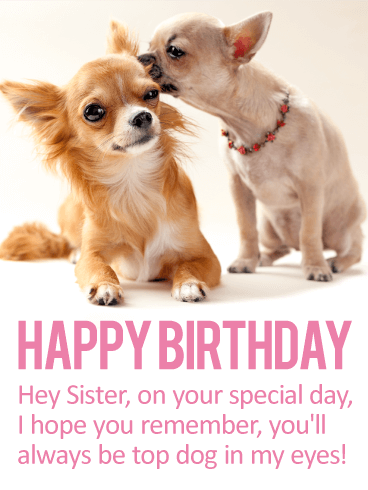 It's easy when you send this card featuring two adorable pups and a special message to let her know how much she means to you. Whether you see her every day, or you stay in touch across the miles, it's important to remind your sister that no matter what, she'll always shine in your eyes. 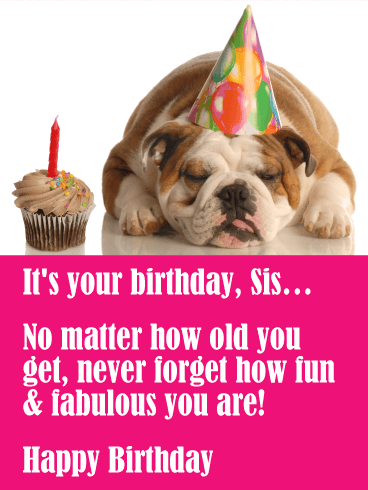 With plenty of sass and a whole lot of sweet, this birthday card is sure to make your sister smile! 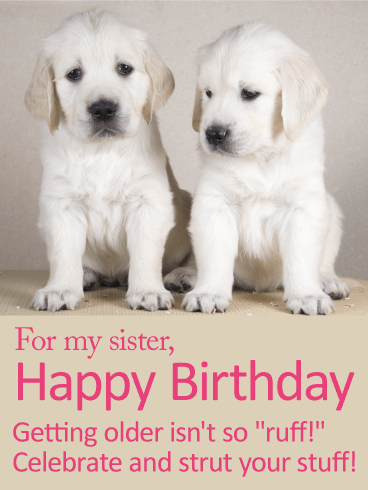 A pair of puppies will remind her that no matter how many candles there are on the cake this year, it's not so "ruff" turning another year older. Because as long as you have a positive attitude and lots of people who love you, it's the perfect time to step out and "strut your stuff!" You've been inseparable ever since you were little. And now that you're all grown up, the bond you share with your sister is just as strong! This year on her birthday, let her know that wherever the destination, you'll always be by her side, wishing her love, support and all the happiness in life. It's a sweet and comforting sentiment as she celebrates her special day. The party cat has arrived! 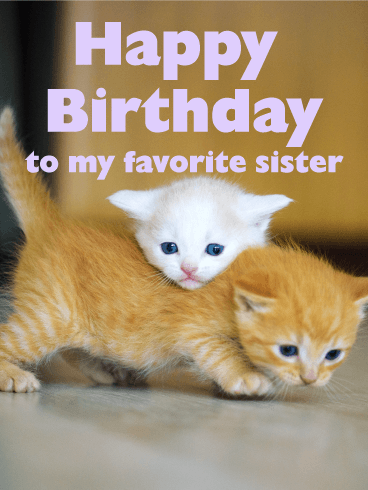 Celebrate your lovely sister's birthday with this adorable (and kind of hilarious!) birthday card. This kitten really knows how to wear a party hat. She has a personal plate of fluffy, yummy cupcakes and a special message for your terrific sister. 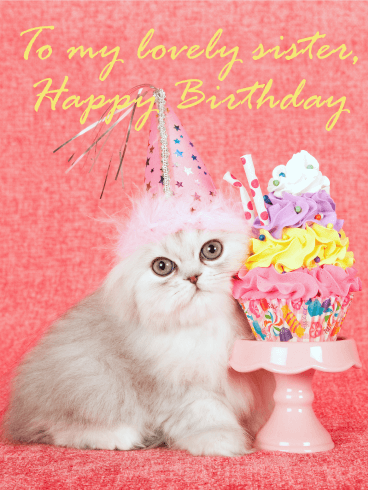 Say "Happy Birthday" in the best way possible-with a cat and cupcakes! I mean, need we say more? 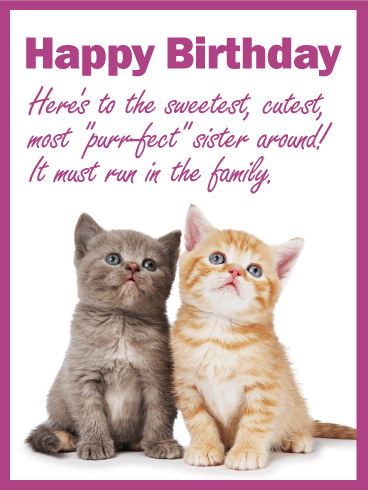 A cute, furry, birthday cat card is-dare we say it-purr-fect in every way.